Technical data sheet Large graphic display Simultaneous display of all the parameters Carrying case with necessary accessories Features and benefits Ergonomic and robust conductivity meter, IP67 waterproof; resistant in harsh working conditions. 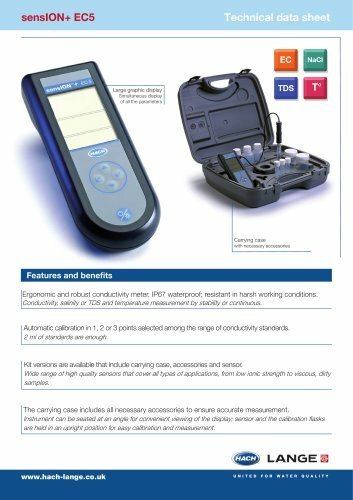 Conductivity, salinity or TDS and temperature measurement by stability or continuous. Automatic calibration in 1, 2 or 3 points selected among the range of conductivity standards. 2 ml of standards are enough. Kit versions are available that include carrying case, accessories and sensor. Wide range of high quality sensors that cover all types of applications, from low ionic strength to viscous, dirty samples. The carrying case includes all necessary accessories to ensure accurate measurement. Instrument can be seated at an angle for convenient viewing of the display; sensor and the calibration flasks are held in an upright position for easy calibration and measurement.